About: WPS stands for Wi-Fi Protected Setup and it is a wireless networking standard that tries to make connections between a router and wireless devices faster and easier. It works only for wireless networks that have WPA/WPA2 security. That’s great, however there is a problem with WPS, it can easily be cracked and allow a hacker access to your home WiFi network. WPA2 security is very secure and there really is no way of hacking WPA2 without using a dictonary attack which can take months depending on the hardware you are using to bruteforce. It can also be a waste of time if your password is very long and includes many special characters, however if you have WPS enabled on your router (which it usually is by default) there is a faster way to hack your WiFi and it can be usually done in a maximum of 12 hours. Objective: To disable WPS on our Netgear WNDR4500 router to improve WiFi security. Instructions: You will need to begin by opening your browser and typing in the IP address for your router. 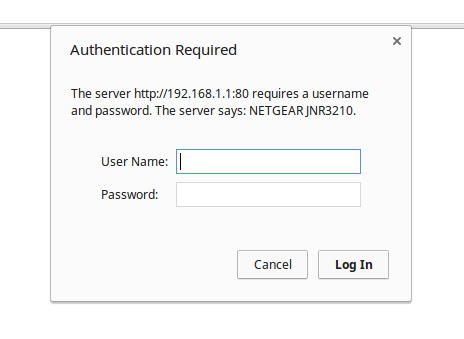 The default is usually http://192.168.1.1 on Netgear routers. Type in the username and password. The default username is ‘admin’ and the default password is ‘password’.